Healthy Summer Food Essentials - Hilltop Acres Poultry Products Inc.
It’s safe to say it’s officially summer for us here in Canada. We know that summer’s the perfect time to head outdoors and get some fun in the sun, but did you know it’s also the perfect time to switch up your diet? Because we’re outdoors more often in the summer, there’s more risk of health issues like dehydration, skin irritations, and vitamin deficiencies. This is where healthy summer food choices come in and it also certainly doesn’t mean you can’t enjoy tasty summer barbecues and desserts. With this post, we’ll share some great food essentials that’ll keep you looking and feeling healthy throughout the summer. If you haven’t already, read our previous post on the impact of seasons on what we eat. For summer, lots of fresh, in-season fruits and vegetables are always good options to constantly have in your diet. Even though there should be a focus on eating healthy for the summer, there are lots of options that are easy to make (or eat straightaway) that are delicious and won’t make you feel like you’re missing out on the fun stuff. Let’s take a closer look at some of these options. 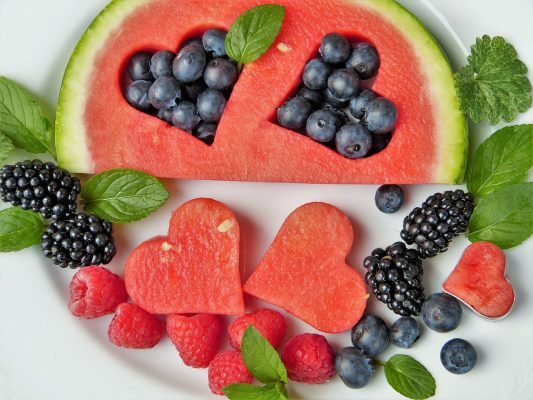 Fruits & Vegetables: Oranges, Watermelons, Cantaloupe, Honey Dew, Cherries, Blackberries, Blueberries, Strawberries, Peaches, Broccoli, Carrots, Corn, Lettuce, Tomatoes, Potatoes, and this isn’t a complete list of what’s in season for the summer! These fruits and vegetables are very rich in nutrients that are crucial in the summer months (i.e. they contain healthy doses of Vitamin A, B, C, E, Potassium, healthy fats & help detoxify the body). Meats: We’re very much in barbecue and grilling season. As we kick off those summer barbecue parties, it’s important to remember that whether you’re a fan of Chicken, Beef, Pork or Seafood, there are lots of healthy options out there that are delicious and easy on your wallet. To start, grilling your meats is certainly a healthy way to go because you aren’t submerging your meats in so much oil like some other preparation methods. Grilling also has other healthy benefits like…when done properly (i.e. using lean meats and marinating before grilling). Also, check out this helpful guide (for seafood lovers) that shows you how to season and grill your fish without having it dry out and lose useful nutrients. Yogurts: Arguably one of the most healthy and slimming foods around. Yogurt is a fun addition to any meal as a dessert or can be enjoyed as a snack. It’s important to keep in mind that just because Yogurts are famous for being packed with probiotics, which stimulates healthy digestion, it doesn’t mean all of them are created equal. As a consumer, it’s essential to be alert and wary of products that have added sugars and unnecessary additives. One alternative is to try unsweetened yogurts and make it sweeter with natural additives like fruit. This will ensure you’re not consuming more processed sugar that doesn’t do any good for your body. Additional options are to try homemade yogurt recipes so you’re fully in control of the kinds of ingredients you put in. Alright then! We’ve given you the quick run through of the good stuff that you can eat to keep your body healthy through the summer (and possibly year round). Now it’s time to list the not so good stuff that will have you feeling sluggish, bloated and could leave you at risk of blood sugar spikes, heart disease, and skin issues (acne). Greasy & Fried foods: This one is fairly obvious but we’ll go ahead and explain. Foods that are oily are usually filled with a lot of calories for small servings. This means that the more you eat these types of foods, the more you put yourself at risk of body weight increases and other medical conditions, such as high blood pressure, stroke, diabetes, heart disease, certain types of cancer. In addition, fried foods also take longer to digest and make the body feel sluggish. Also, just because you’re adopting a healthier diet for the summer doesn’t mean oil should be completely eliminated from the diet – healthy oils with less saturated fats like Sunflower, Olive and Canola are necessary for a balanced diet. Caffeine: This is definitely a tough one. Canadians love our caffeine and coffee so it certainly won’t be an easy task laying off the caffeine this summer. However, caffeine consumption generates excessive heat in our bodies which isn’t the best feeling to have in the scorching summer heat. For those of us who find it hard to drop the coffee and caffeinated drinks, how about swapping those drinks for iced teas, green teas or freshly squeezed lemonades for a cool and refreshing summer feeling. That’s not all, these alternatives also help boost productivity. For many people, summer is the best season of the year, not just because of the bright and longer days, but also because many people will get a chance to enjoy the beauty of nature. A lot of tasty fruits are also in season for us to enjoy. We recommend checking out your local farmers’ markets to get a taste of what’s in season; come see us, Hilltop Acres Poultry and try our products. See our locations and hours here. As we enjoy the weather we should strongly consider what we fuel our bodies with so that we can look forward to the colder months with good health. The key is knowing what to eat and what to avoid. This means considering what you’re dressing your foods with, and opting for organic options whenever possible. By taking these little steps, you’d be surprised at how much better your body ends up feeling while enjoying tasty foods. Next time family and friends come over for a barbecue, swap the traditional burgers and hot dogs, with grilled chicken or some fresh fish. These tasty food options have more health benefits than traditional hamburgers or hot dogs, and will leave your insides feeling more comfortable in the long run.